Got plastic bags? They could save your life! 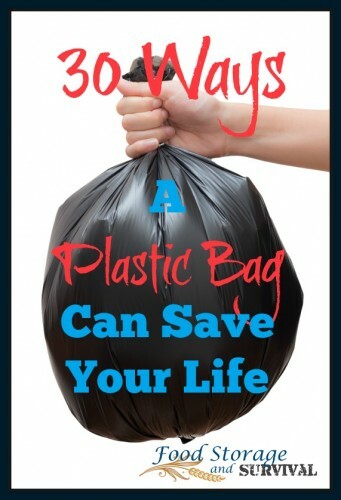 Today we’re sharing a list compiled by the folks at PlasticPlace.com of the many preparedness uses for plastic bags (plus a little commentary by me anywhere you see these blue italics). From making cordage to collecting water to emergency signalling, the survival uses for plastic bags are many and varied. Lightweight and inexpensive, they are an item you’ll definitely want to add to your emergency kits. Ready to put them to use? 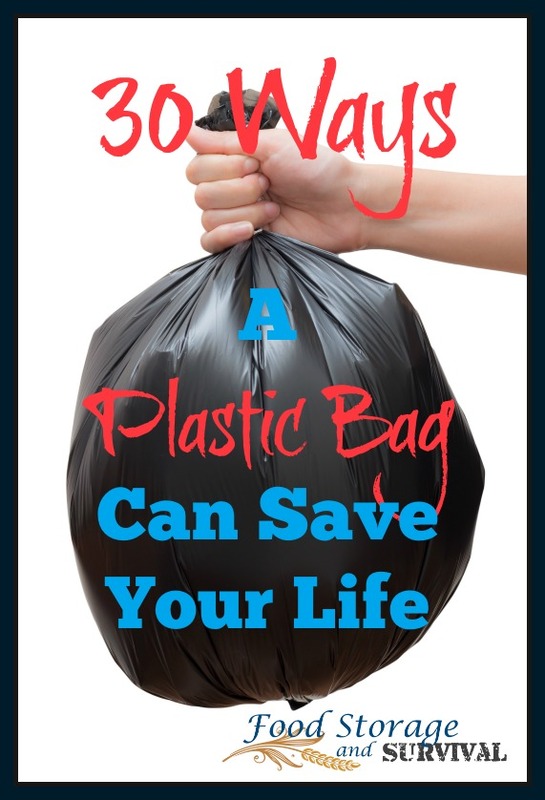 Here’s 30 ways a plastic bag can save your life. 1. Rope and cordage: It’s possible to make strong and durable rope by hand just using garbage bags. Once you’ve got rope, you have the beginnings of shelter, splints, and so much more. Check out this video for the technique. 2. Knapsack: Use sturdy garbage bags and some of that cool garbage bag rope you just made to build weatherproof carrying bags. 3. Wound irrigation: Getting enough water pressure to flush out a wound can be a challenge out in the wild. Poking a small hole in a bag filled with clean water can help clear the wound more effectively with less water. 4. Ice pack: If you need to apply cold to an injury but want the patient to stay otherwise warm and dry, filling the corner of a bag with snow or ice is the way to go. 5. Tourniquet: In a crisis first aid situation, where it’s imperative to stop the bleeding quickly, a sturdy strip of garbage bag applied as a tourniquet can safe life and limbs. 6. Emergency bandage: Keep a cut clean and dry and keep the pressure going by tying a layer of plastic bag around whatever you’re using to staunch the bleeding. 7. Sling: Support and immobilize injured arms with a strong, flexible piece of heavy trash bag. 8. Stretcher: Combined with branches, contractor grade garbage bags are tough enough to support the weight of an injured companion or other heavy load. 9. Create a quarantine: Whether you’re dealing with a zombie virus or something more day-to-day, plastic bag screens and masks can help to slow the spread of disease. 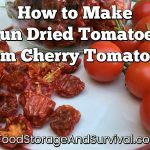 Cut them open and use for sealing doors and windows in your quarantine zone! You’ll also need some duct tape. 10. Flotation device: They might not be the sturdiest life-jackets, but in a tight spot filling a strong garbage bag with air and sealing it shut can buy you a bit of buoyancy. 11. Food storage: Don’t want to attract bears and other wildlife when you’re spending time outdoors? Put your food in several layers of plastic bags (to cut down odors) and then hang it from a tree away from your sleeping area. 12. Water collection: Drinking out of puddles can cause disease. With a plastic bag, you can catch rain or dew in a cleaner environment. Dig a shallow hole, line it with the garbage bag, and weigh down the edges with rocks. 13. Solar still: Turn salt water into drinkable fresh water with a black trash bag. Here’s a video that will show you how. 14. Transpiration bag: Yet another amazing way a garbage bag can help you get water. Find a leafy branch in direct sunlight, give it a shake to get any critters out, and tie a see thru trash bag around the branch. 15. Boil water: Boiling water is the best way to purify it, but if you don’t have a pot what are you supposed to do? Boil in the bag. We’re serious. Check it out in this video. 16. Signalling: A white or brightly colored garbage bag can make all the difference in a search operation. Wear it or wave it to flag down helicopters, boats, or passing travelers. 17. Trail markers: another great use for colored trash bags. Cut small strips off the bag and tie them to branches as you go. This will help searchers follow your trail in thick forests, and let you easily retrace your steps if necessary. Make sure you can see your last marker from the next one you tie so it’s easy to follow your trail! 18. Shelter: A couple of big drum liners, combined with a rope or a branch, can make an amazingly effective one-man tent. If you’ve ever watched Bear Grylls try to build a shelter from what’s in the wild, you know it’s not easy. Avoid having to skin a sheep by carrying a couple of our strong 95 gallon bags You’ll save time, energy, and calories. 19. Fly screen: Especially in mosquito-infested areas, getting some relief from bugs can be a big deal. Cut some slits in a large garbage bag and hang it across the opening of your shelter. It will discourage insects but let important ventilation through. 20. Sleeping bag: Right? No explanation needed. Bigger is better: check out one of these extra tall bags for the best comfort. 21. Mattress: Stuff it with whatever you can find. This isn’t just about comfort: your body loses a lot of heat in contact with the cold ground. Insulating your sleeping space can be a literal life-saver. Even just getting your head and torso off the ground will make a noticeable difference. The plastic will also serve as a moisture barrier from ground moisture. Good deal all around. 22. Dry storage: Anyone who has ever been cold and wet knows that a dry pair of socks is the closest thing to heaven in that situation. It can also fend off frostbite and gangrene. Keep your spares toasty in at least one layer of plastic. 23. Spare shoes: If your footwear isn’t waterproof, a layer of trash bag can provide protection from puddles and rain. I remember doing this as a kid with bread bags inside my snow boots! My mom was resourceful like that. 24. Vapor barrier: Most people have used a garbage bag as an impromptu poncho once or twice, but staying dry becomes much more important out in the elements. Protecting your warming inner layers from rain and mist with an environmental shell layer like a plastic bag is an important survival step. Tip: add a few small vent holes to prevent moisture from sweat and condensation from building up inside the bag. 25. Safety vest: If you’re lost in the woods and it’s hunting season, you want to be saved, not shot. An orange trash bag worn over your clothes will keep hunters from accidentally aiming at you. Bright orange is great for any time you want to be seen or found! 26. Hypothermia layer: If you’re caught outside in dangerously cold temperatures, a plastic bag is excellent for conserving body heat. Keep the hole for your head as small as possible, and don’t bother making arm holes, just hug yourself and hold the heat in. If there are dry leaves, pine needles, or other materials like newspapers around, you can stuff the bag to increase insulation. Bonus: black garbage bags will absorb whatever sunlight is around. 27. Waste containment: Sorry to be gross, but it’s important. In a disaster, disease is what usually causes the second wave of devastation. Plastic bags are indispensable for maintaining hygiene in this situation. A simple bucket can be turned into a toilet and you’ll want plenty of garbage bag liners handy when you need to use it! Or use the bags to line your home toilet when the water isn’t working. 28. Shower: Staying clean is actually really important in an environment where infection can kill. If water is plentiful and you want to wash, fill a strong black bag and hang it from a branch. After it’s warmed in the sun for a while, poke a hole in the bottom and splash around. 29. Low-tech washing machine: This is a similar technique. Agitating your clothes in an extra-thick garbage bag of sun-warmed water can be surprisingly effective, and takes a lot less energy than scrubbing against rocks. 30. Fish trap: A big plastic bag can make it much easier to catch protein-rich fish without a rod and reel. How would you use a plastic bag for survival? Leave your ideas in the comments! You probably have plastic bags around your house, but if not or if you’re looking for something a little different, PlasticPlace.com has a huge selection of plastic bags! Now go get some in your emergency kit!